Depart Nairobi to begin your search for the “Big 5”—lion, leopard, elephant, rhino, and Cape buffalo. First, stop at the famed Mount Kenya Safari Club for lunch as you take in stunning views of Mount Kenya. After lunch, continue on to SAMBURU NATIONAL RESERVE, known for its arid landscape and unique wildlife. Due to the dry climate, grasses are sparse, making animals easier to spot. Meanwhile, the Ewaso Ng’iro River, which borders the reserve, provides a year-round water supply. These two factors make for a great game-viewing experience. During your AFTERNOON GAME DRIVE, you have the chance to see rare animals you will not see in other parts of the country. Commonly referred to as the Samburu “Special 5,” this includes Grevy’s zebra, reticulated giraffe, Somali ostrich, beisa oryx, and the gerenuk, a long-necked antelope that feeds while standing on its hind feet. Leave Ol Pejeta and journey through the beautiful Kenyan highlands, one of the most fertile agricultural areas in all of Africa, where farmers grow crops such as corn, wheat, coffee, and tea. 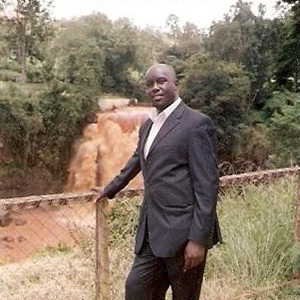 Stop at NYAHURURU FALLS, also known as Thompson’s Falls, and then on to LAKE NAKURU NATIONAL PARK. During your AFTERNOON GAME DRIVE you may see waterbuck, giraffe, impala, flamingo, and striped hyena. This is also your best chance to see white rhino, which are commonly spotted here. This morning, depart for MAASAI MARA NATIONAL RESERVE, Kenya’s most famous game area. “The Mara,” as it is called by locals, is part of the Serengeti ecosystem and boasts a strong permanent population of game. When the Great Migration of wildebeest and zebra arrives, generally from August to early November, the population enlarges by almost 2 million. This provides a great food source for predators such as lion, cheetah, leopard, and hyena. After lunch at your lodge, set out on an AFTERNOON GAME DRIVE. After breakfast, board a plane for the quick flight to Nairobi. After a short break, drive to AMBOSELI NATIONAL PARK, best known for spectacular views of Mount Kilimanjaro, the highest mountain in Africa at some 19,341 feet. Embark on an AFTERNOON GAME DRIVE before settling in at your lodge. MORNING & AFTERNOON GAME DRIVES are included today. Amboseli affords you a great opportunity to get close to the mighty elephant. You might also spot Cape buffalo, zebra, wild dog, and more. This evening, as the sun sets with “Kili” as the backdrop, savor SUNDOWNER DRINKS in the bush! This morning, cross the border into Tanzania. After lunch in Arusha, proceed to your lodge along the rim of the Great Rift Valley escarpment. Check in and enjoy some leisure time prior to dinner. Embark on a MORNING GAME DRIVE in LAKE MANYARA NATIONAL PARK. This small park is ecologically diverse, with groundwater forests, grassy plains, and alkaline Lake Manyara itself. Watch for elephant, Cape buffalo, giraffe, and more. The park is also home to the world’s largest concentration of baboons. Afterward, take in spectacular views of Lake Manyara during a special BUSH LUNCH. Then, journey to the nearby village of TLOMA. Here, you will visit a LOCAL FAMILY’S HOME to learn more about the local Iraqw culture and their traditional way of life. You will also stop at a LOCAL PRIMARY SCHOOL to visit with the children and learn about the educational system in rural Tanzania. Continue on to the rim of NGORONGORO CRATER, which is part of the larger Ngorongoro Conservation Area. Descend into the crater for a FULL-DAY GAME DRIVE. Ngorongoro Crater is technically a caldera—the world’s largest unflooded one, in fact—at more than 2,000 feet deep with a floor covering over 102 square miles. Game viewing here is fantastic, as most of the animals stay in this area year round. You can see lion, Cape buffalo, hippo, elephant, and flamingo. This is also your best chance to see the rare black rhinoceros. A picnic lunch will be served in the crater. The Serengeti covers an area of roughly 5,700 square miles, so it is no surprise that the name comes from the Maasai word siringit, meaning “endless plains.” Continue your exploration during MORNING & AFTERNOON GAME DRIVES. You have the chance to see the big cats—lion, leopard, and cheetah—as well as an abundance of other animals, including the Nile crocodile, giraffe, gazelle, and eland. Tonight, join your traveling companions for a FAREWELL BUSH DINNER and a TRADITIONAL MAASAI DANCE PERFORMANCE—the perfect end to your safari! 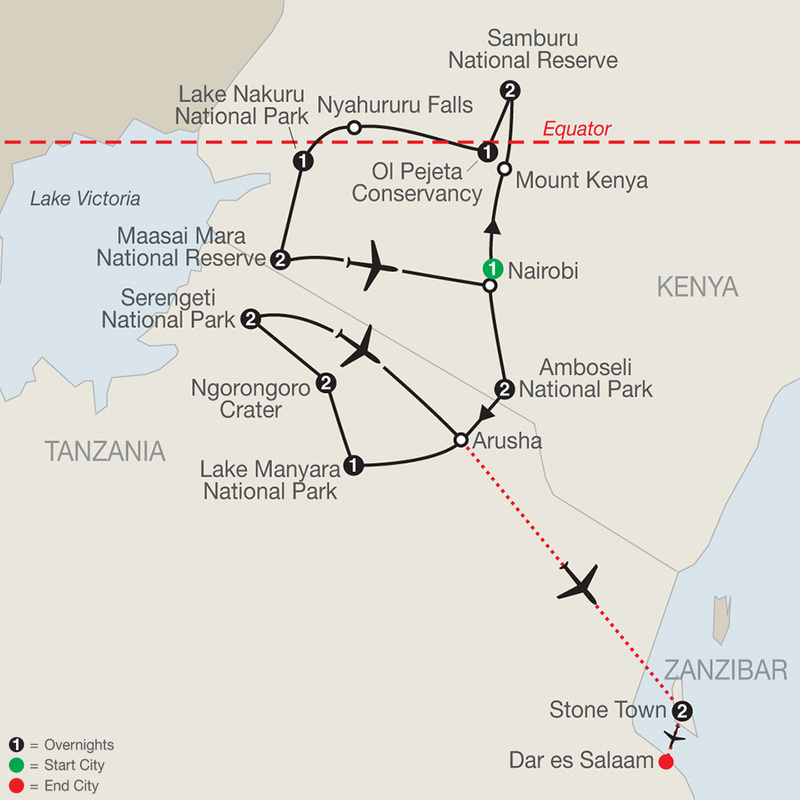 This morning, fly via Arusha to Stone Town, a UNESCO World Heritage Site. Transfer to your hotel and enjoy the rest of the day at leisure. Today, explore the highlights of Stone Town on a PRIVATE GUIDED TOUR. Start with a WALKING TOUR featuring the Old Fort, National Palace, slave caves, and the spice markets. Afterward, visit JOZANI FOREST, where you will take a walk through the forest with a local Ranger. Learn more about the forest fauna, walk through the mangrove swamps, and see the rare red colobus monkey, found only in Zanzibar. The remainder of the day is at your leisure. Fly to Dar es Salaam, where your vacation ends. We have secured a day room at the Dar es Salaam Serena Hotel for you to use prior to your homebound flight. Book homebound flights after 4 pm.